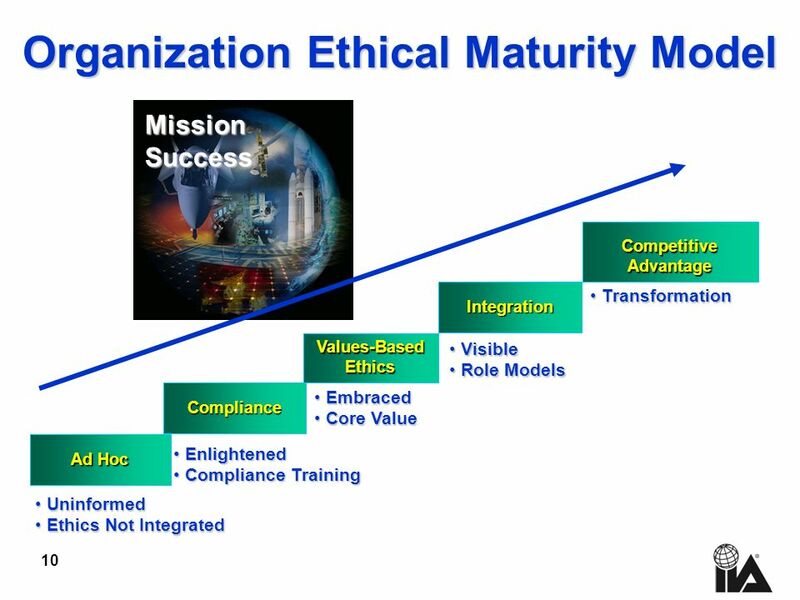 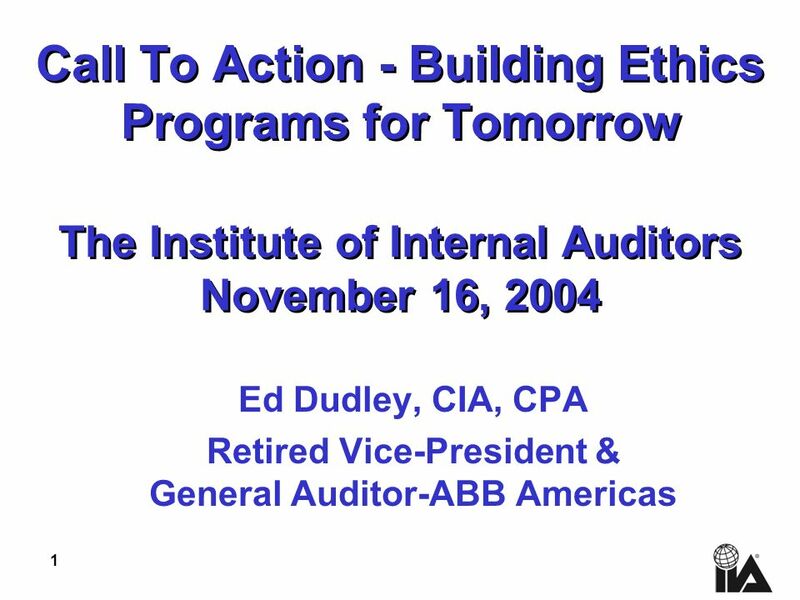 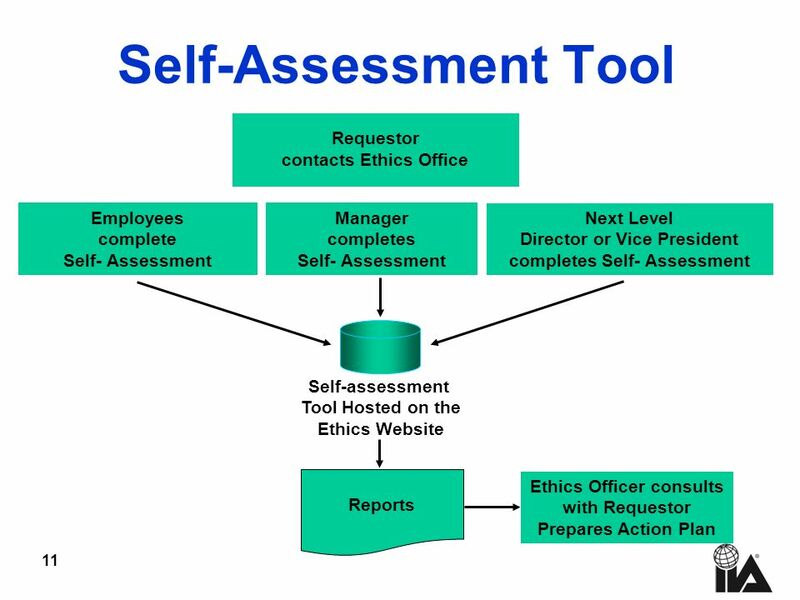 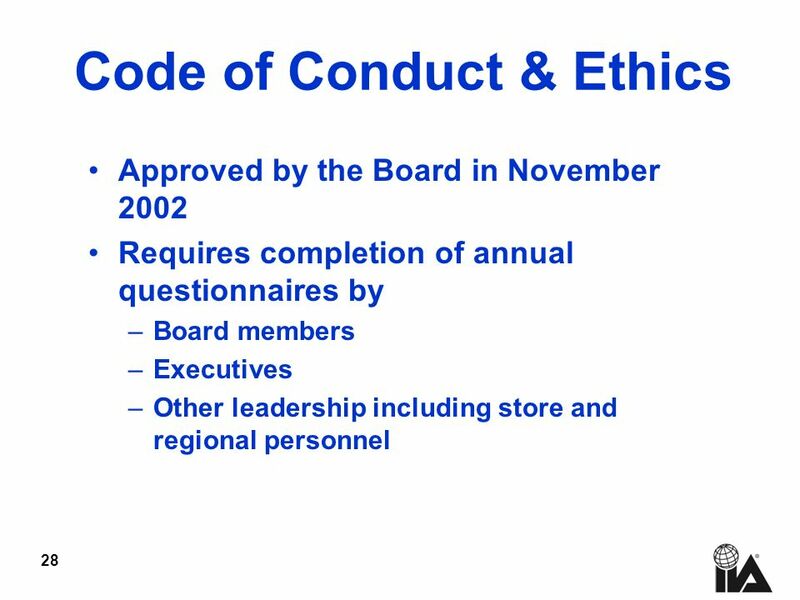 1 Call To Action - Building Ethics Programs for Tomorrow The Institute of Internal Auditors November 16, 2004 Ed Dudley, CIA, CPA Retired Vice-President. 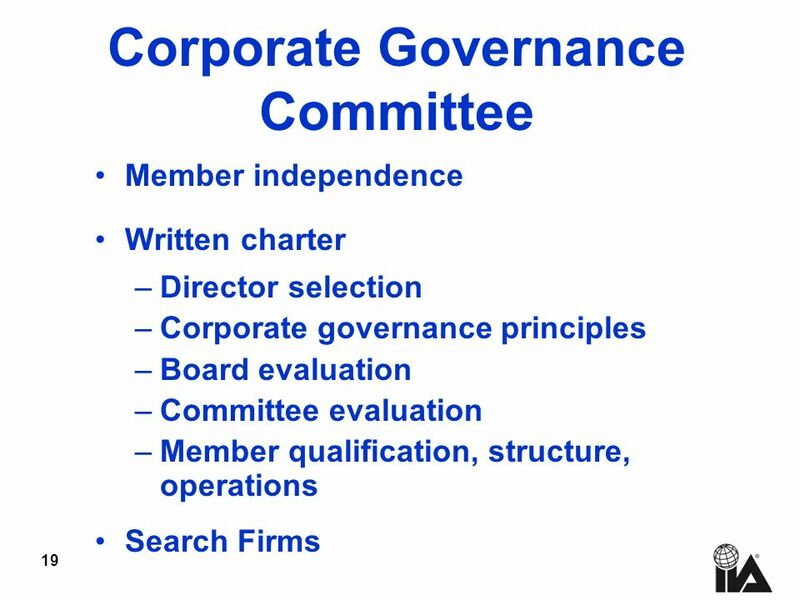 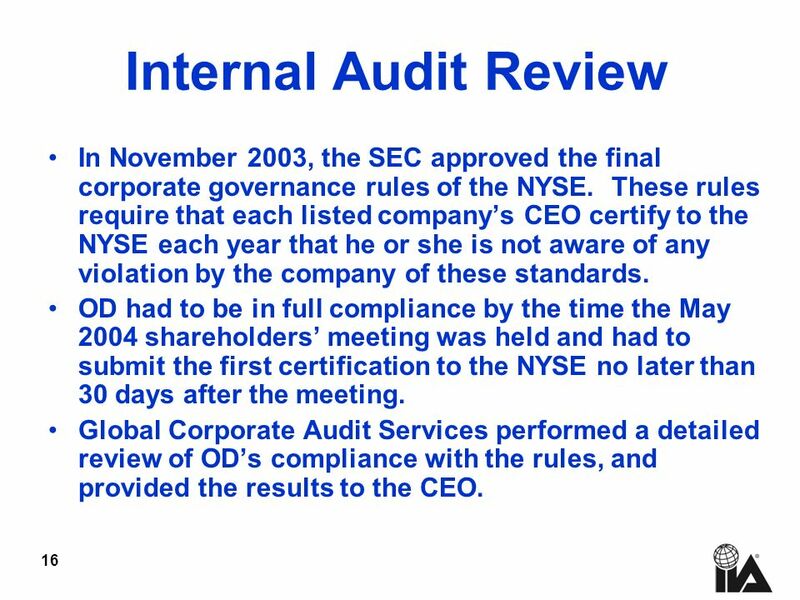 16 16 Internal Audit Review In November 2003, the SEC approved the final corporate governance rules of the NYSE. 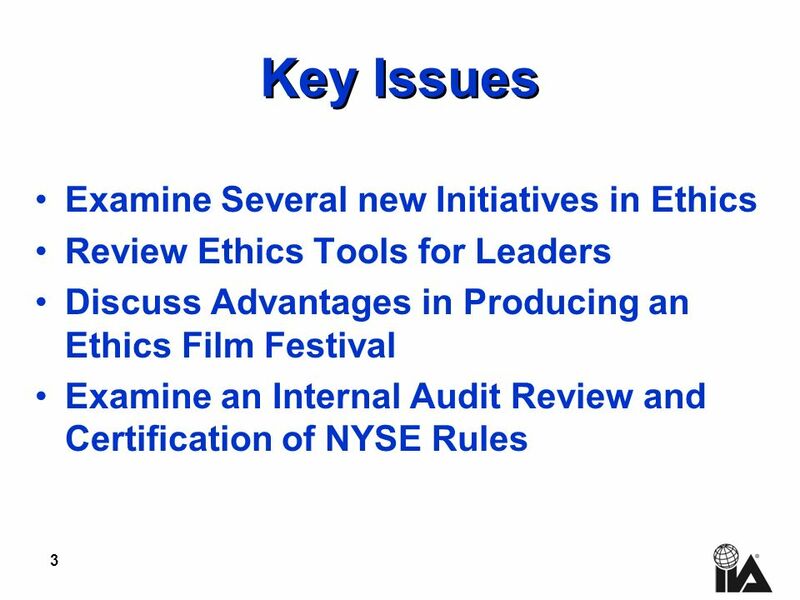 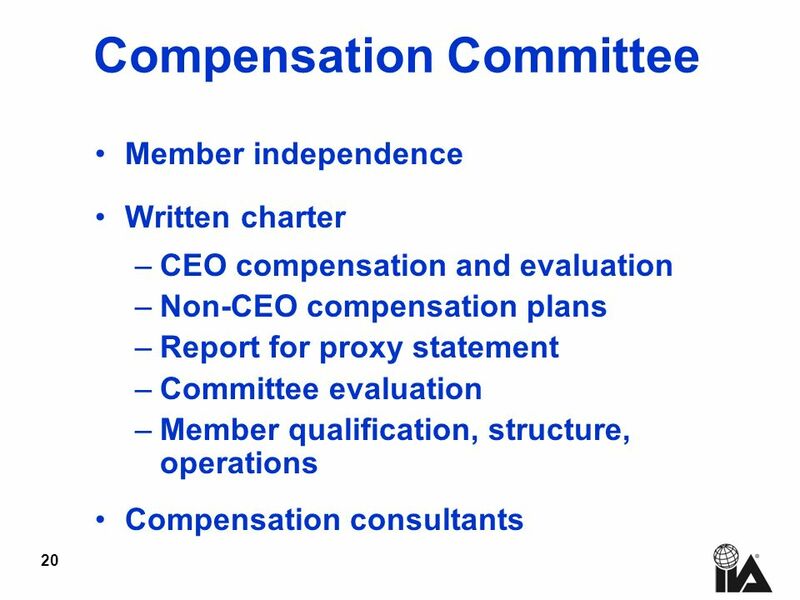 These rules require that each listed companys CEO certify to the NYSE each year that he or she is not aware of any violation by the company of these standards. 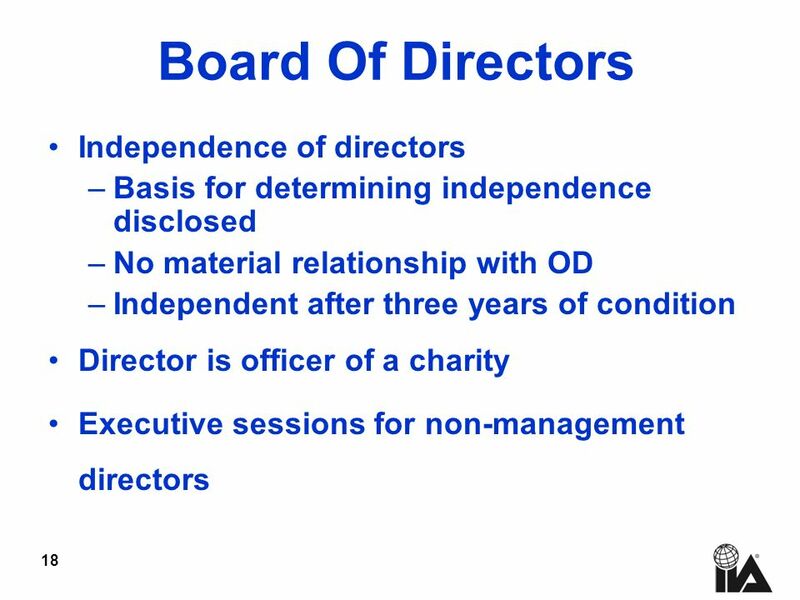 OD had to be in full compliance by the time the May 2004 shareholders meeting was held and had to submit the first certification to the NYSE no later than 30 days after the meeting. 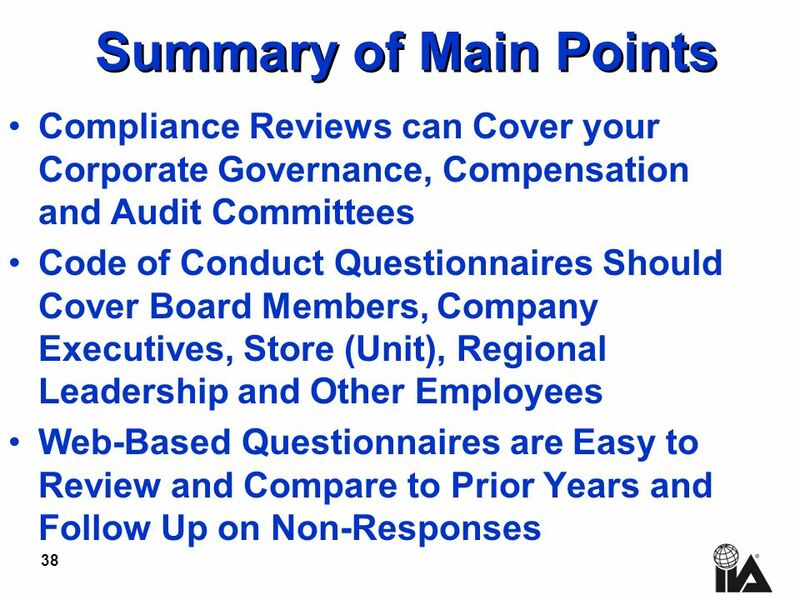 Global Corporate Audit Services performed a detailed review of ODs compliance with the rules, and provided the results to the CEO. 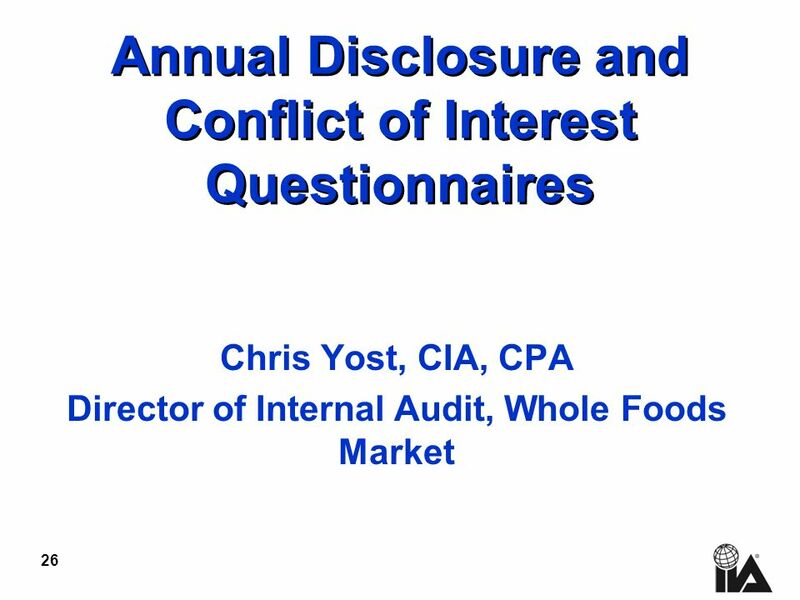 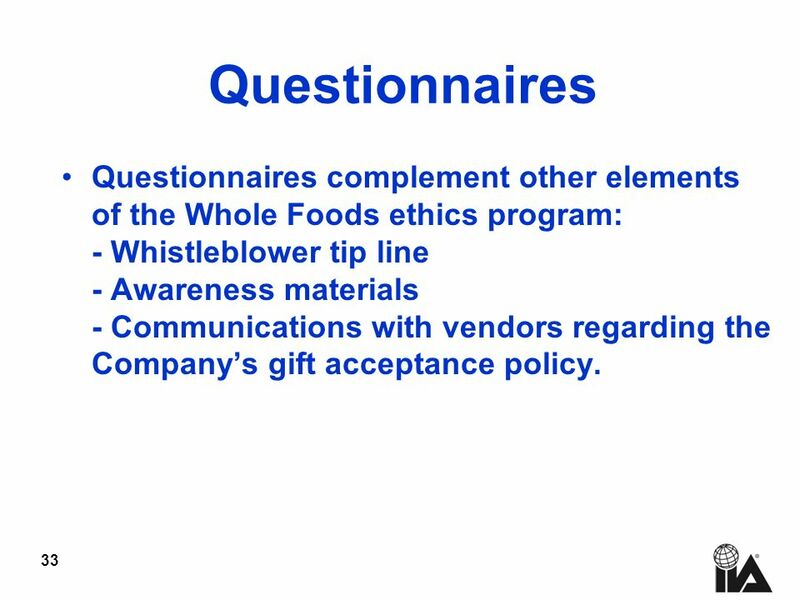 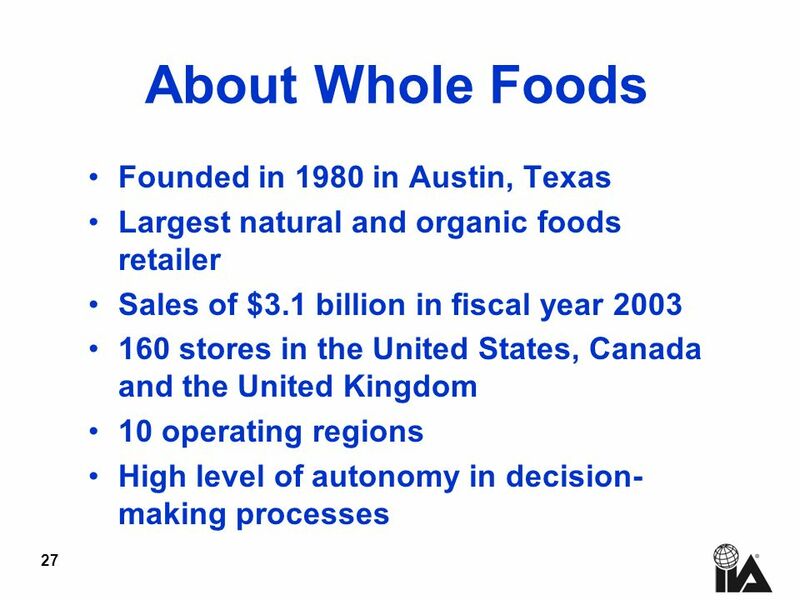 33 33 Questionnaires Questionnaires complement other elements of the Whole Foods ethics program: - Whistleblower tip line - Awareness materials - Communications with vendors regarding the Companys gift acceptance policy. 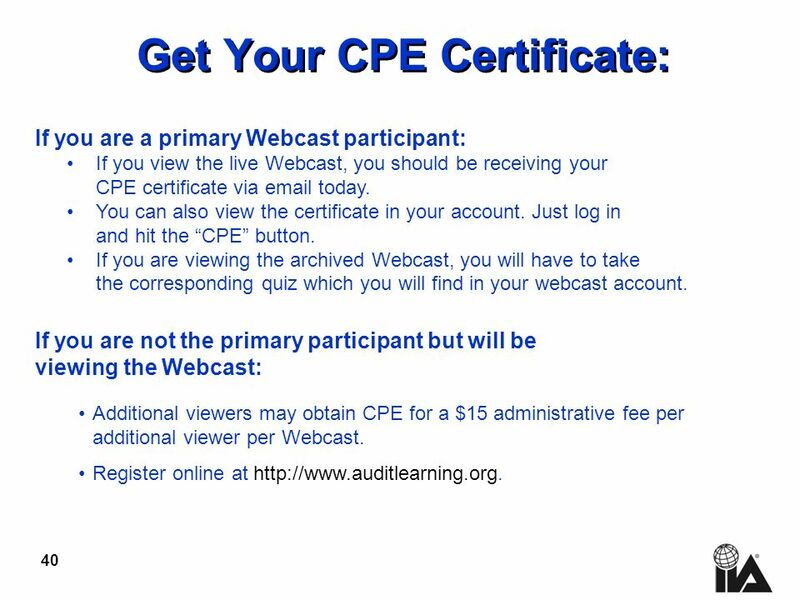 40 40 Get Your CPE Certificate: If you are a primary Webcast participant: If you view the live Webcast, you should be receiving your CPE certificate via email today. 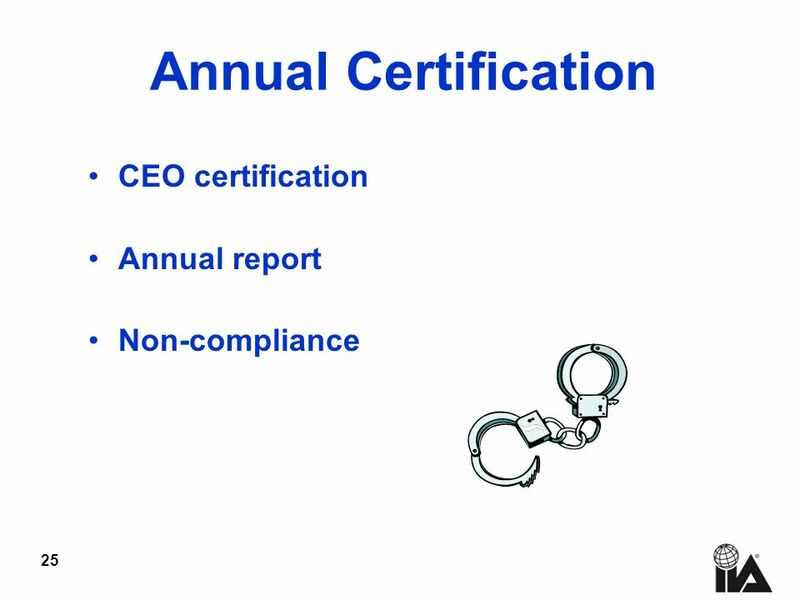 You can also view the certificate in your account. 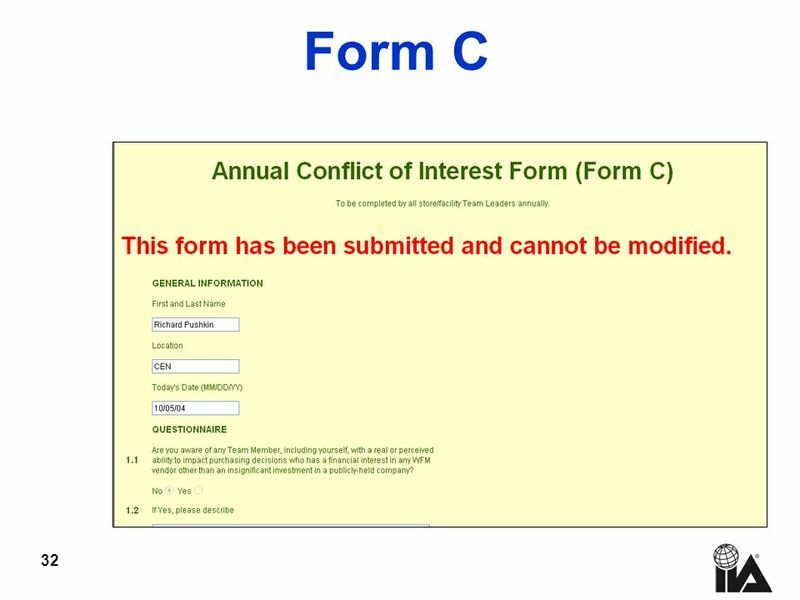 Just log in and hit the CPE button. 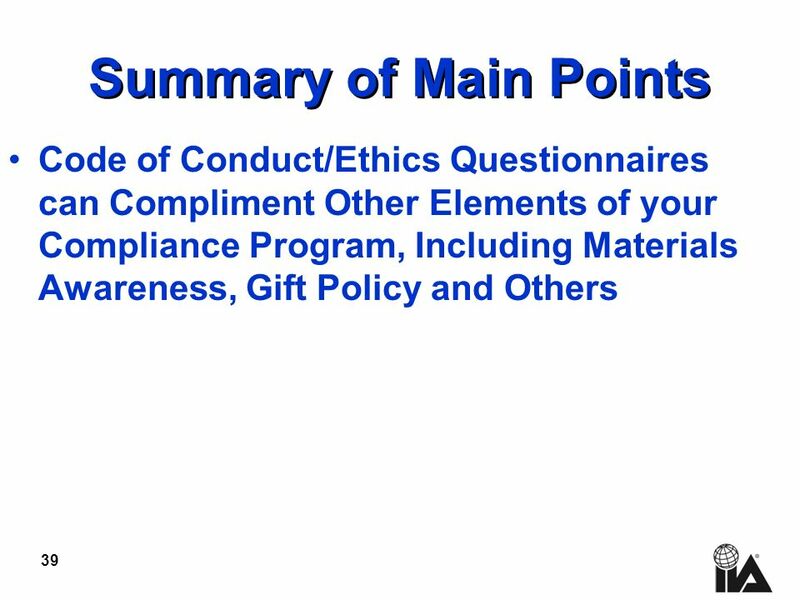 If you are viewing the archived Webcast, you will have to take the corresponding quiz which you will find in your webcast account. 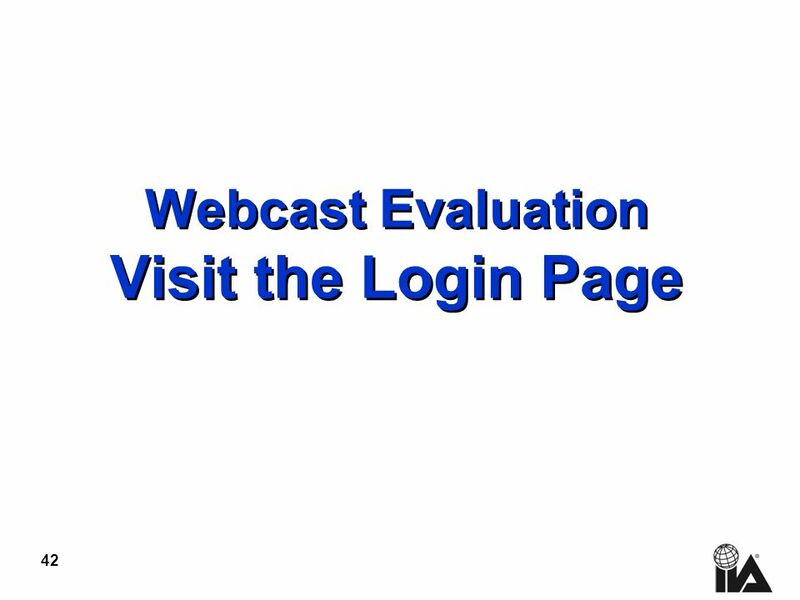 If you are not the primary participant but will be viewing the Webcast: Additional viewers may obtain CPE for a $15 administrative fee per additional viewer per Webcast. 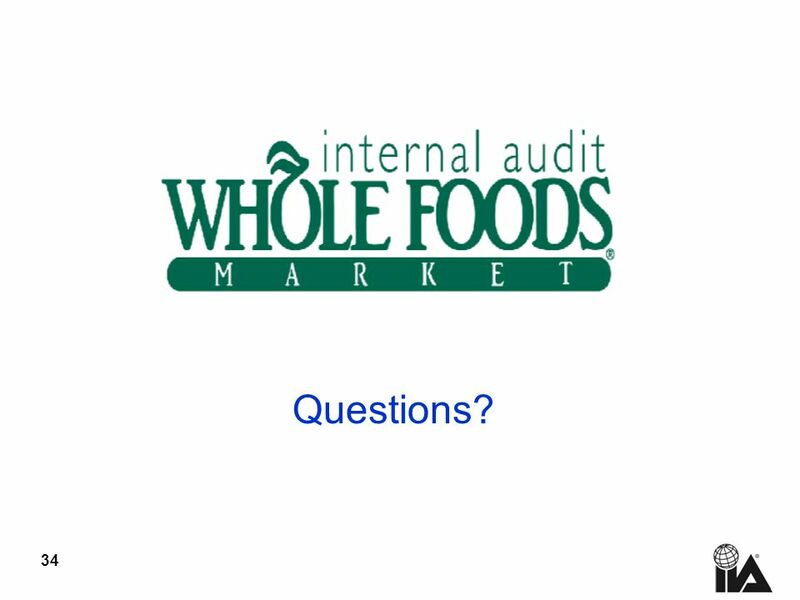 Register online at http://www.auditlearning.org. 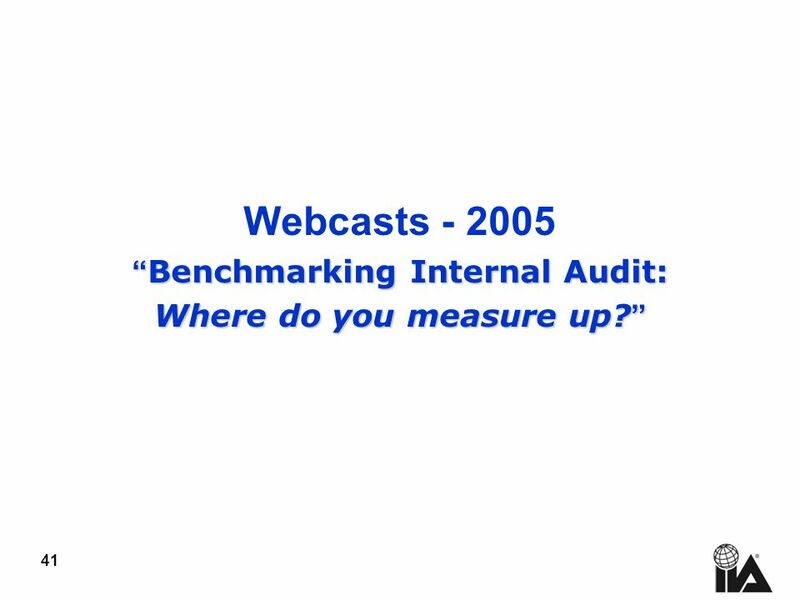 41 41 Webcasts - 2005 Benchmarking Internal Audit: Benchmarking Internal Audit: Where do you measure up? 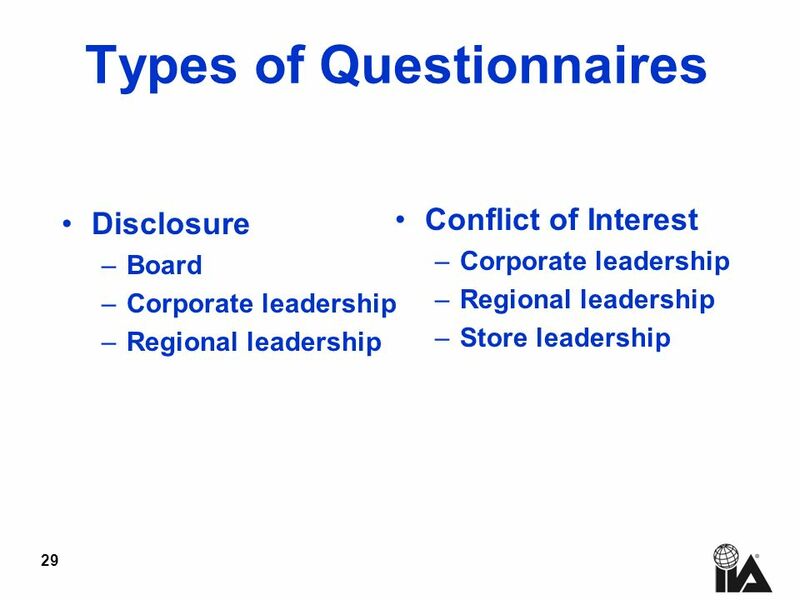 Where do you measure up? 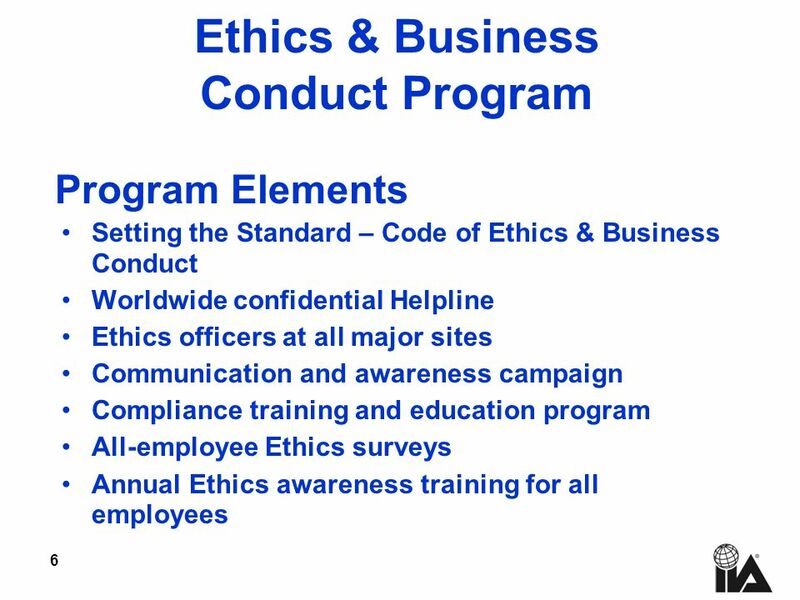 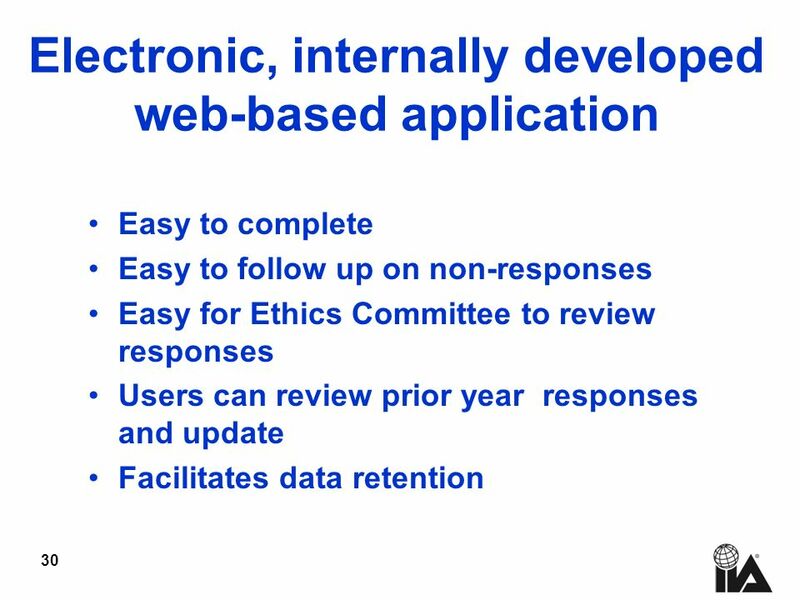 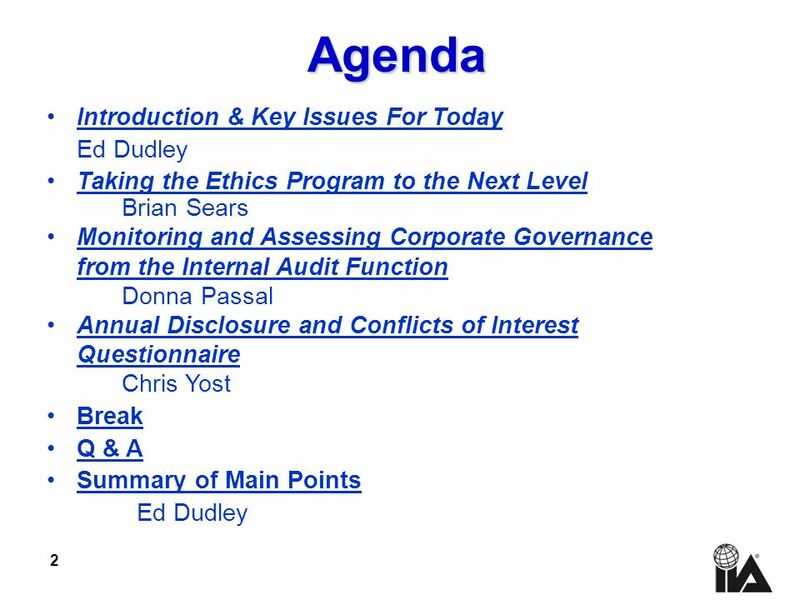 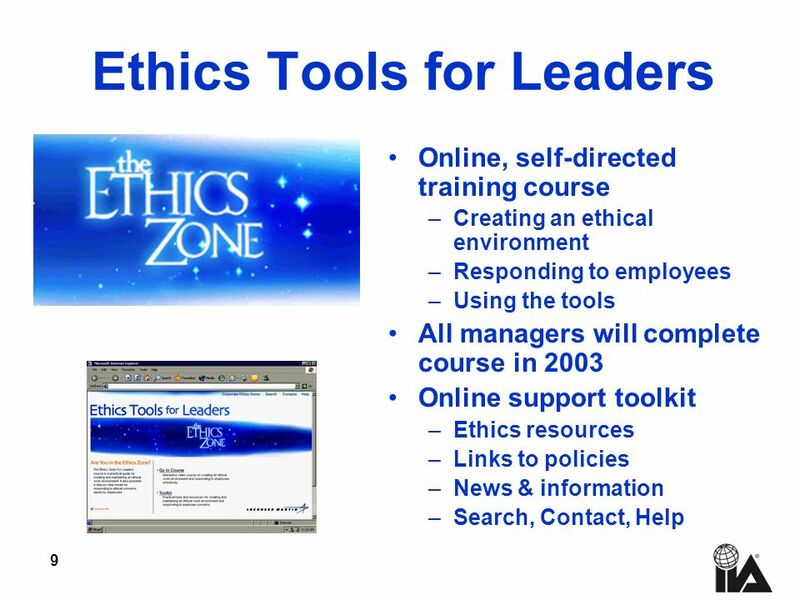 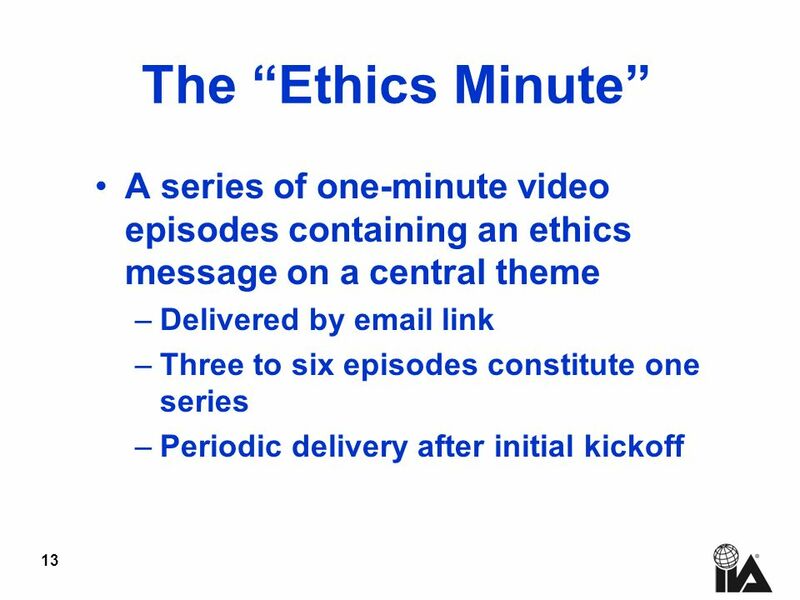 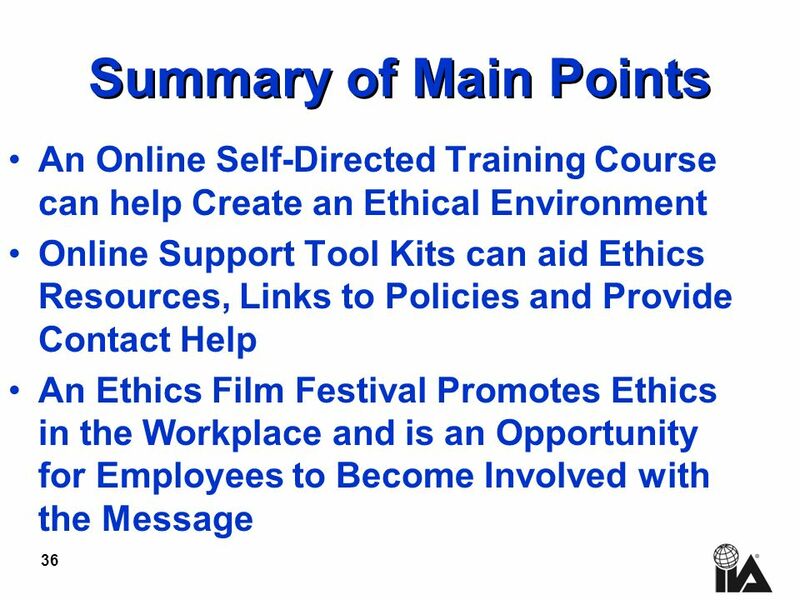 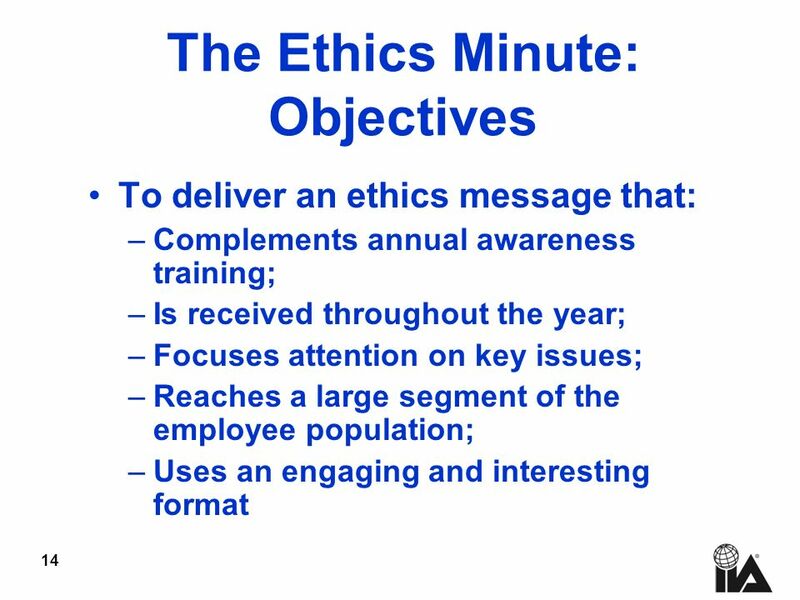 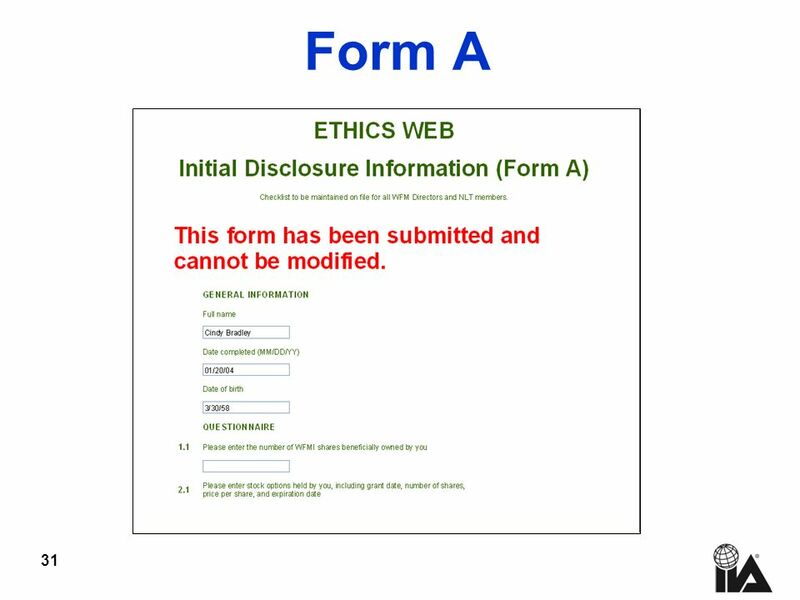 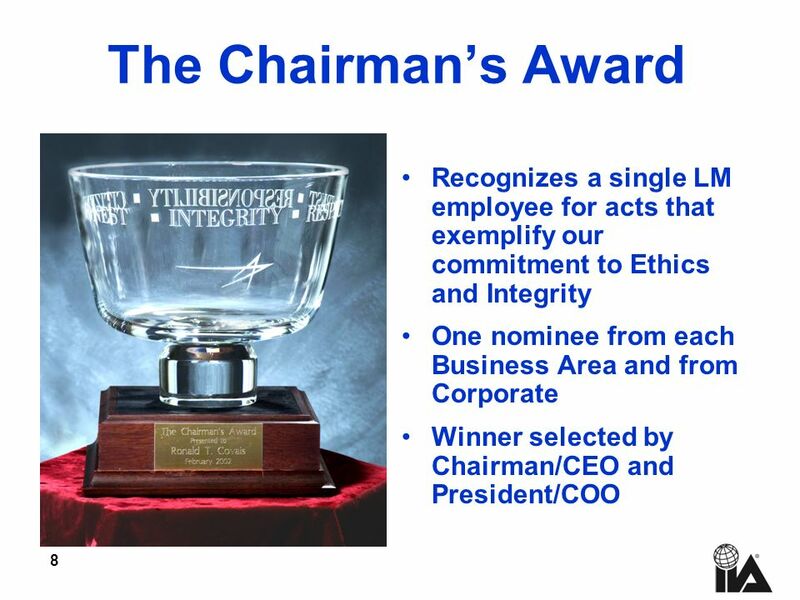 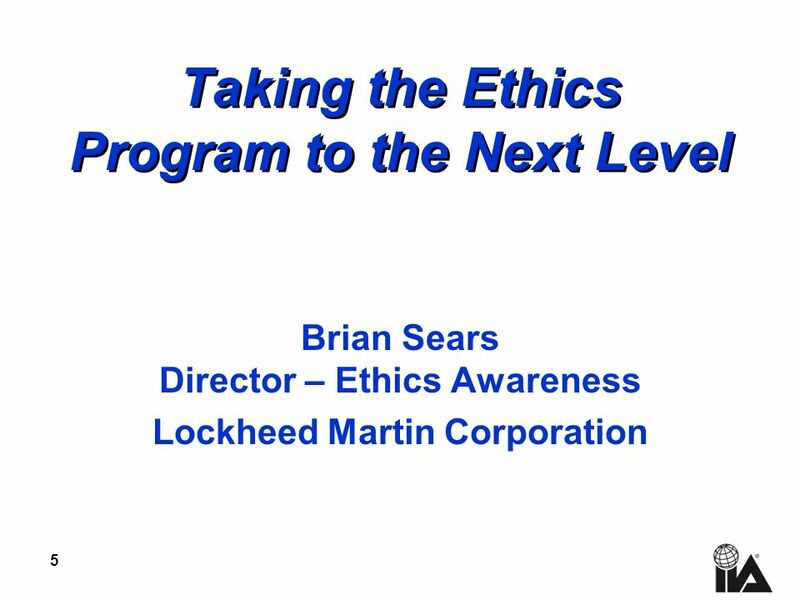 Download ppt "1 Call To Action - Building Ethics Programs for Tomorrow The Institute of Internal Auditors November 16, 2004 Ed Dudley, CIA, CPA Retired Vice-President." 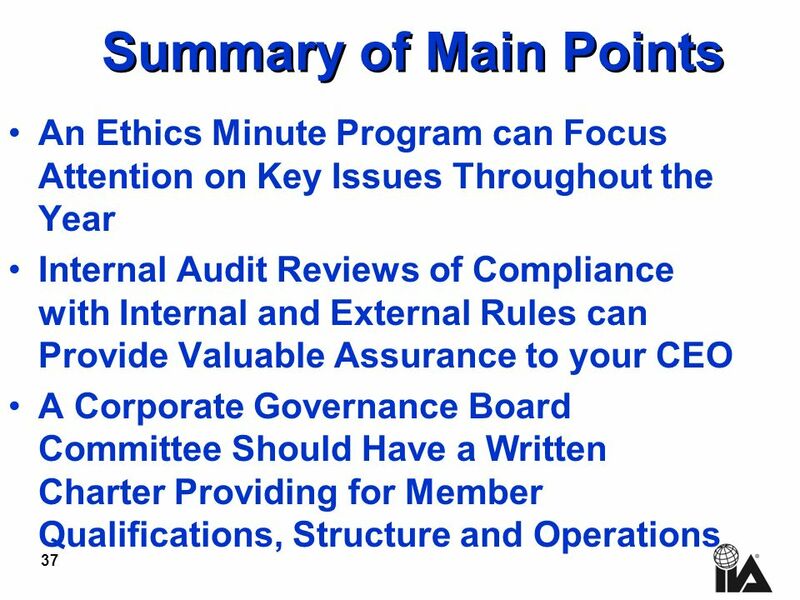 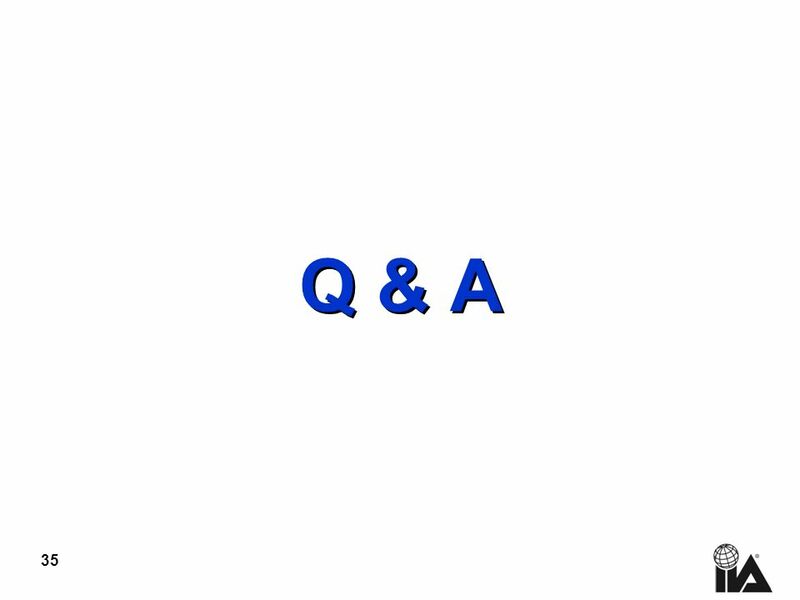 1 Using ERM Concepts in Managing Controls The Institute of Internal Auditors August 10, 2004 Ed Dudley, CIA, CPA Retired Vice-President & General Auditor-ABB. 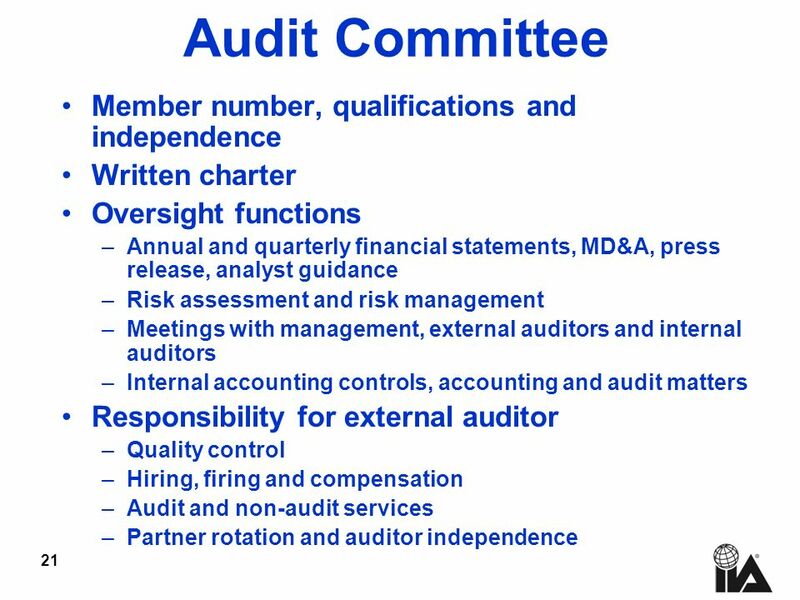 1 Controls Compliance – Rounding the Turn The Institute of Internal Auditors September 14, 2004 Ed Dudley, CIA, CPA Retired Vice-President & General Auditor-ABB. 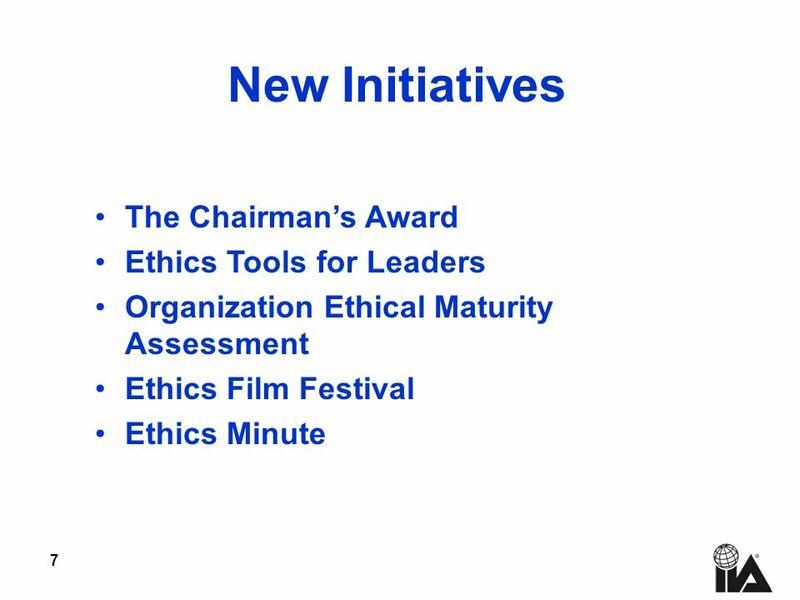 1 Shaping the Future of Rotary International 2007-2010 Lilleström Rotary Institute ÖRSÇELİK BALKAN Director, RI 29 September, 2007.